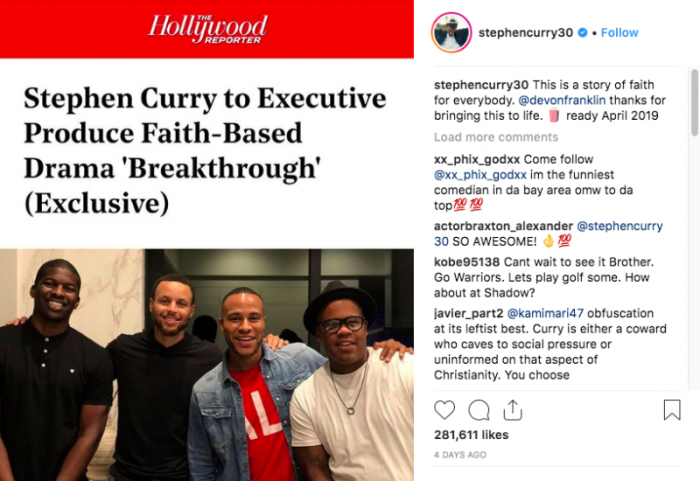 Golden State Warriors star Stephen Curry has signed on as an executive producer for the forthcoming Christian film "Breakthrough," praising the movie as a "story of faith for everybody." The film, releasing nationwide April 12, 2019, is a movie adaptation of Joyce Smith's best-selling book, The Impossible: The Miraculous Story of a Mother's Faith and Her Child's Resurrection and stars Chrissy Metz ("This Is us") and Topher Grace ("That 70s Show"). "When Joyce Smith's adopted son John falls through an icy Missouri lake, all hope looks lost. Even though John lies lifeless for more than an hour, his mother refuses to lose faith and prays for a miracle. To the astonishment of everyone present, her prayers are answered as John's heart suddenly begins to beat again, defying every expert, every case history, and every scientific prediction. Mere days after the accident, he will walk out of the hospital under his own power, completely healed," the movie's synopsis reads. In a statement to The Hollywood Reporter, Curry said he was drawn to the film because it checked all the boxes he's passionate about: faith, family and sports. 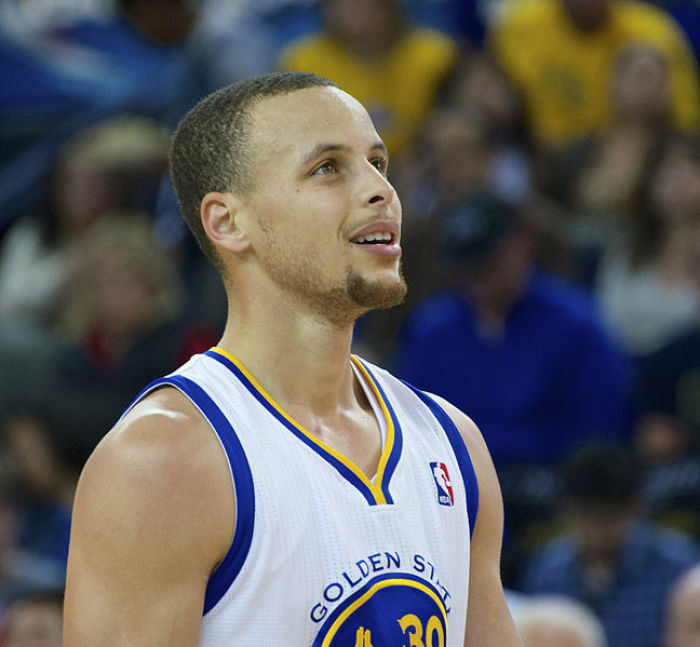 "John's story is nothing short of incredible," said Curry. "It's a story about the power of prayer and perseverance and one I immediately connected to. After reading the script, I knew I wanted to be a part of bringing it to life onscreen." THR notes that Curry's decision to back the film was finalized several months ago and marks his first venture into the film industry since launching his banner, Unanimous Media, earlier this year. While Unanimous has an overall film and TV deal with Sony Pictures Entertainment and is developing many of its own projects, Curry "couldn't pass up getting involved with "Breakthrough" since it dovetailed with his own focus on faith and family-friendly material," THR added. According to the report, DeVon Franklin, who produced "Breakthrough," pitched the film to Curry during a meeting on general movie projects. The NBA star read the script "almost immediately," and was ready to get involved in the film just 24 hours later. Curry also announced his involvement in a recent Instagram post, writing, "This is a story of faith for everybody. @devonfranklin thanks for bringing this to life." "Breakthrough" also stars Mike Colter ("Luke Cage"), Josh Lucas, Lecrae and Marcel Ruiz. In addition to Curry, the Rev. Samuel Rodriguez will executive produce the picture. "We are so honored and thrilled to have Rev. Samuel Rodriguez on board as executive producer for our movie," Smith said in a statement shared with The Christian Post. "From the moment Samuel heard about our story he has been the pivotal vessel God has used to propel our story of my son's resurrection and total healing. We are so thankful for this divine connection."